Disruptive behaviors feel like they are on the rise – and not just in healthcare. Bad behaviors are showing up across the globe, in our cities, our schools, neighborhoods, and our homes. Every day we witness acts of cruelty, ignorance, bullying, incivility, and just plan ol’ meanness. We could just sit around complaining about it and share the horror on Facebook – or we can do something about it. As I have written about many times, we are all influenced by the people we spend the most time with, the music we listen to, movies we watch, books we read, what we listen to on the radio, etc. Your environment shapes your perception of the world and therefore, shapes other people’s perception. If you expose your brain to negativity – people who constantly complain, negative news, violent movies, bullies, coworkers who gossip, mock, and talk badly about other coworkers – your world will look cruel. However, if you expose your brain to positivity – people who consistently talk about good things, listen to motivating messages and watch inspiring movies, etc… if you surround yourself with heroes, do-gooders, and kind people – your world will look kind. The antidote to cruelty is to spread kindness. To help you influence YOUR workplace, I’m starting a Kindness Revolution to STOP bullying and incivility in healthcare. I reached out to my community on Facebook and asked for ways other nurses are doing their part to spread kindness and influence their coworker’s perception of the world. Some of these ways are theirs and some are mine. Some are general, while some are specific. Nellie Jones, CMSRN, a practicing medsurg nurse in Indiana, brings a crockpot meal every weekend she works because in her organization, the cafeteria closes early on the weekends. By doing this, she makes sure her coworkers are fed!! Find out what someone’s favorite snack food is (mine is popcorn!) and surprise him/her with that yummy treat – just because. Many departments have suggestion boxes. Instead, why not create a “compliment box” where everyone is encouraged to compliment their coworkers by writing down something positive about them on a small piece of paper, folding it up, and dropping it in the box. Once a month at the staff meeting, read the compliments out loud for everyone to hear (remember…influence!!). My sister Tina is a nurse in southern California who did this at her work. She built a board in her break room filled with positive messages, inspirational pictures (probably cute baby and puppy pictures), and encouraging affirmations. 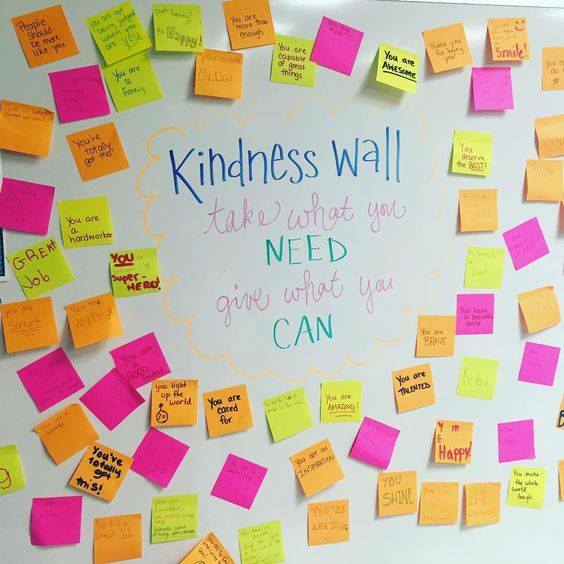 Any time someone was having a cranky day, she would say, “go to the kindness board! !” She’s so funny. She would even walk them right to the board and say, “Now read this and don’t come back out until you feel better.” I love her! Tina Durham, RN, Mother Baby Nurse, CA. Similar to what my sister did, find a place in your break room that employees can post one affirmation or note of encouragement on a sticky note. Encourage everyone – every day to “take” and “give” a kind note. 7. Find every opportunity to recognize and thank your employees for their great work! When we obsess in what’s wrong, we miss what’s right. As you know, random acts of kindness have been shown to create more joy within the person “giving” than the person receiving. Buy a coworker a “good” cup of coffee and put it on his or her desk. I’m a huge note-card fan. Why not find an inspirational note-card and give it to a coworker who might not expect it. Clean up the break room (and that awful, disgusting microwave) even though you didn’t create the mess. 10. Spread messages of kindness EVERYWHERE!! Post messages in the break room, hallways, nurses’ station, bathroom, supply room, and on the patient’s white boards – EVERYWHERE!! Like a virus, kindness will spread! I recently created a “BE KIND” button that you can wear on your jacket at work. Just another reminder to everyone that kindness matters! And if you’re on social, use the hashtag #Bekind as a way to influence others to spread kindness at work – not cruelty. 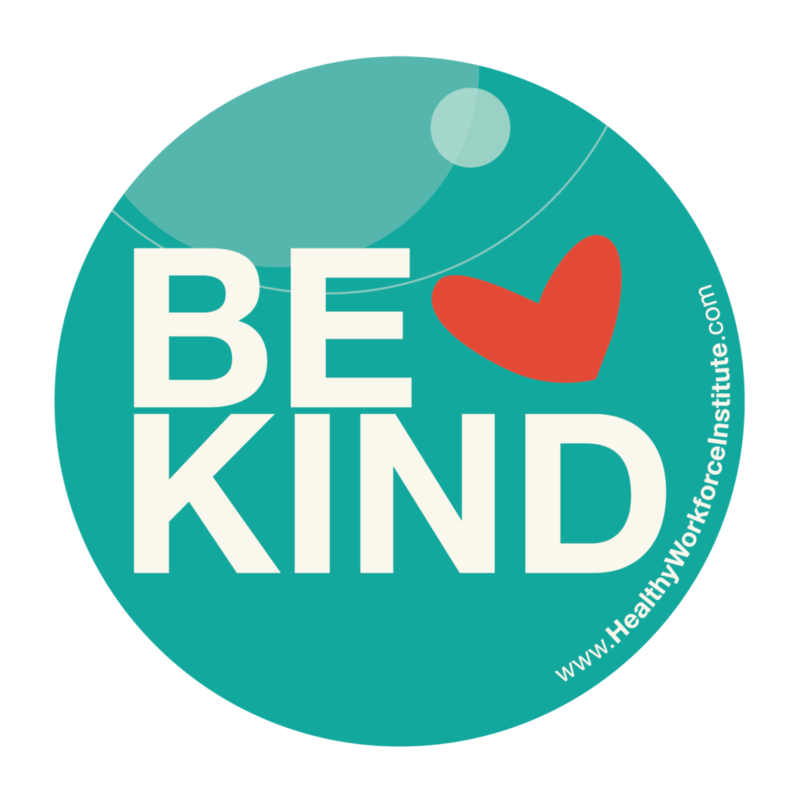 Click here to get my Be Kind Buttons for your department. And one last bonus tip: Give hugs. What other ways do you spread kindness at your workplace? Please post in the comment section below. We’d all love to learn more ways to spread kindness!! Thanks for taking the time to comment! Yes. These tips can be adapted to parenting too! Thanks for your encouraging words Dr. Renee. Work can be stressful enough without taking it out on one another in the midst of such moments. The continuity of our kindness to one another is an example of why nurses are the most trusted professionals in patient care. It is our positive attitude that makes a difference for a patient or nurse colleague having a bad day. I agree that it takes intentional reflection on what is important so we can act kindly to all those around us! Yes yes! Thanks Lynne. If we would just spend half the energy supporting each other as we do squashing each other, we could make a bigger positive impact in healthcare. It's my goal to create and sustain a movement of nurses, physicians, and support staff who recognize the importance of respect, kindness, and professionalism in healthcare. I recently wrote each coworker an encouraging tag and gave them annomously. One person figured it was me and asked me, but I noticed a happier group of coworkers. Time to do that again! I love this Naomi! yes...repeated over time, kind and encouraging words and compliments can change a culture!! In the outpatient setting, I am learning that there is a great need for leaders, not just nurse leaders to step up and take a stand to STOP workplace incivility and to STAND UP for Kindness. There is no excuse to allow verbally aggressive behaviors, rude tone or language, demeaning condescending manners shall not be tolerated anymore! People may think their behavior is okay, because no one has had the courage to tell the how their behaviors affect the majority. Kindness 101, good old respect and courtesy, please and thank yous and smiles, truly are the way to go! You are so right Elisa!! We all need to do our part to address and eliminate disruptive behaviors AND promote kindness, professionalism, and respect!